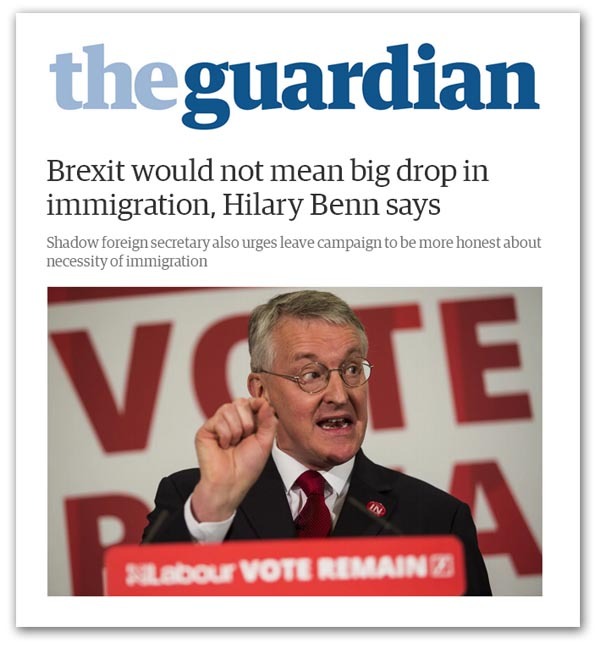 As the arguments on the immigration grind on, we see shadow foreign secretary Hilary Benn trying to up the ante, declaring that Brexit "would not put a stop to high levels of immigration of foreign workers". They would "still be needed to care for Britain's ageing population and staff the NHS", he says. This, however, is missing the point. None but the most extreme are suggesting a complete block on immigration. The Vote Leave proposal on the table is an Australian-style points system, aimed at restoring UK control over the number of migrants permitted to take up work in this country. Calling it a "points system", though, is a misnomer. Of the migrants admitted to Australia, only 23 percent come under the points system. Control is exerted by reference to an arbitrary quota, set annually – currently at 190,000. It is, by any measure, a quota system. Now, if Benn is missing the point, and Vote Leave are getting it wrong, we have been vastly understating the options available to us if we leave the EU and exercise the Efta/EEA option. From our recent research, it now looks as if there is a precedent for participating in the Single Market while operating a quota system. Up to press, we've been projecting a binary choice. We can have participation in the Single Market or we can reject freedom of movement (FoM). We can't do both, albeit that we can implement a unilateral "emergency brake" on immigration, under exceptional circumstances, invoking the "safeguard measures" under Article 112 of the EEA Agreement. In Flexcit (p.126) we report that these measures had been invoked by EEA member Liechtenstein. Initially, though, that effect was achieved when it joined, through an addendum to the EEA Agreement. This was Protocol 15, which allowed the country to impose "quantitative limitations" on immigration until 1 January 1998. What happened then was that, in 1995, the EEA Joint Committee - part of the formal consultation structure set up under the agreement - concluded that the situation at the end of the transition period "might justify the taking of safeguard measures by Liechtenstein as provided for in Article 112 of the EEA Agreement". In Decision No 1/95 of 10 March 1995 it asked the Contracting Parties to "endeavour to find a solution which allows Liechtenstein to avoid having recourse to safeguard measures". No such solution was found so, in 1997 just before the end of the transitional period, Liechtenstein unilaterally invoked the safeguard measures, thereby continuing to keep the existing immigration restrictions in place when the transitional period ended. There were further attempts to resolve the situation in 1998 which were unsuccessful. On 17 December 1999, the EEA Joint Committee decided that the "specific geographical situation of Liechtenstein" still justified "the maintenance of certain conditions on the right of taking up residence in that country". But in order to resolve the situation, it came up with the proposal for a longer-term solution which it set out in Decision No 191/99. This innovative solution allowed Liechtenstein to introduce a quota system controlling the number of workers allowed to enter the country. The arrangement was given formal status by an amendment to Annex VIII of the EEA Agreement, setting out what were called "sectoral adaptations". This is cross-referred to Annex V on free movement of workers. The decision provided for a new transitional period until 31 December 2006, and allowed for the new measures to apply subject to a review "every five years, for the first time before May 2009". After reviews in 2009 and in 2015, it was concluded that there was no need to alter the current rules. The provisions on the Sectoral Adaptations could remain unchanged. Under the current arrangement, in 2011 there were 598 applications for permanent residence from economically active people. Liechtenstein issued 41 residence permits. Half of the total available are decided by a lottery which is held twice a year. The numbers involved are, of course, small beer. But Liechtenstein is a tiny country. What matters though is that a precedent has been set within the framework of the EEA Agreement. It is possible to suspend freedom of movement in respect of a single country and replace it with a quota system for an indefinite period. It matters not that Liechtenstein is a micro-state. It is a fully-fledged contracting party within the terms of the EEA Agreement. What applies to one legally can apply to any or all. And, totally contrary to the claims of Open Europe, the arrangement is effectively permanent. For Liechtenstein, it is in its seventeenth year. Whatever the EU might declare in terms of freedom of movement being "non-negotiable" for EU members, therefore, it has conceded that it is negotiable for Efta/EEA states. And if the Sectoral Adaptations avenue was closed to us, the alternative for the UK as an Efta/EEA state would be unilaterally invoke Article 112, as did Liechtenstein. We could then apply our own controls. Either way, it is undeniable that there are options within the framework of the EEA Agreement. If tiny Liechtenstein, with a population of 37,000 spread over an area of 61 square miles – less than half the area of the Isle of Wight – can manage it, we should be able to do something like the same deal. On this basis, there should be no barrier to the "leave" campaign adopting the Efta/EEA option as part of a broader Flexcit plan, resolving immigration and participation in the Single Market. This has the potential to be not just a temporary "fix" but a permanent solution.